Funny! I was just wondering about this last week while I was making homemade Mac and cheese! I just stumbled across you blog and am really looking forward to looking around your site more. Love this post. Too cute and I thought I was the only one who boiled pasta in milk rather than water! Mac and cheese is the ultimate comfort food and thanks for pointing out how little effort it actually takes to use real food ingredients. So very cool. Loved the experiment, but having done it I new the answer. My family loves beef stroganoff. You could compare the Hamburger helper brand to homemade. I use an can of mushroom soup and about a 1/2 cup of sour cream and salt and pepper to taste for the sauce. Hands down it is better. Blessings to you. How about brownies? It takes about the same amount of time to make them from scratch; they should cost less and they definitely taste better. 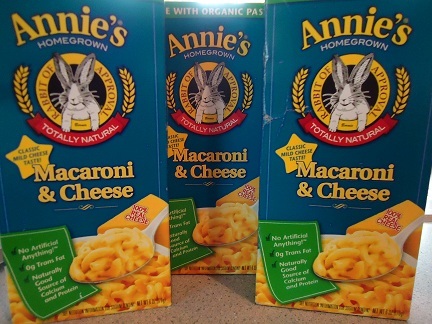 At my grocery store, Annie’s mac and cheese is over two dollars a box. So, it is definitely cheaper to make homemade mac and cheese, even with a good raw cheese. 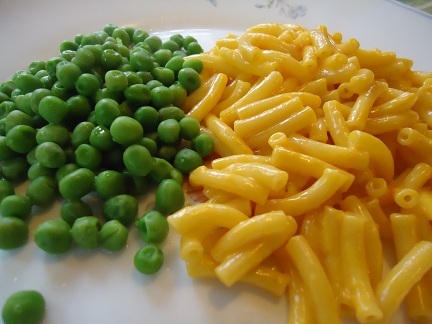 My 4 year old wants yellow mac n cheese, any ideas for coloring homemade mac n cheese naturally? In the Little House books they make butter yellow by grating some carrot and heating it in the milk. They then strained it with a cloth (I’m guessing cheesecloth would work well) and squeezed all the milk out of the carrot. Maybe that would work here too! A touch of ground tumeric might work… it makes everything yellow! You could try stirring in some pureed butternut squash. Annato is what’s typically used to color butter yellow and they use beta-carotene (which is what makes carrots, among other things, orange) to color cheese orange. You could use a natural food coloring. There are plenty available. Try Amazon.com. @Kristin: turmeric makes things yellow without too much change in flavor. Thank you for breaking it down! I am pleasantly surprised at how little extra the homemade works out to be. Hands down homemade only. Colorful mac n cheese anyone? No thanks. Good post! The only trouble for my family is that they don’t particularly care for homemade mac and cheese and Ive tried many recipes! My husband always just wants the boxed. Even Annie’s he doesnt love. He’ll eat it but he’d much rather any unhealthy kind! what to do then!?!? Sorry to laugh, Daria, but I’m laughing WITH you, because we are in the same boat! 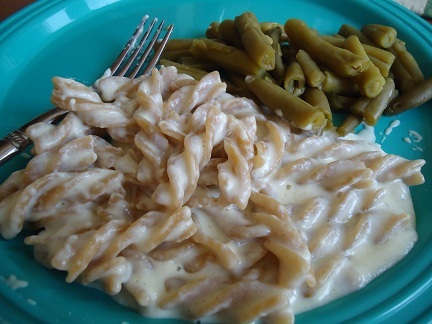 NONE of my kids like mac and cheese, and I have a fabulous and easy homemade recipe. Every time I make it, but husband says, “You should buy a box of Kraft mac and cheese the next time you shop.” Seriously??? I’m not knocking Kraft, but the homemade stuff tastes so much better! So, I can empathize with you! (poorly) his whole life. I do what i can, but it is hard!! some homemade and combine them. Gradually make it more homemade. then when they are expecting. This isn’t a question about food prep time- but My son is lactose intolerant so I never keep cows milk in my house. We both LOVE Mac & Cheese, and would love to try your method, but I cannot use cow’s milk. Any chance on doing a taste-test for almond, rice, or soy milk? I avoid soy products, but think that rice or almond milk should work in this recipe. If you give it a try, be sure to let us know how it turns out! Jessica, I recently made Laura’s Hamburger Mac n Cheese using Coconut milk (my middle daughter has a dairy intolerance) – did it as a freezer meal, then thrawed it out and threw it in a pan. Baked it til it was warm — outcome: Everyone gobbled it up! Next time I will probably use Almond milk so I would say that would work good too. good luck! I froze almond milk (by itself because I wasn’t drinking it fast enough not long ago and it separated when I thawed it out. Just wanted to give you a heads-up in case you try freezing a dish with the almond milk. My husband and I definitely enjoy homemade mac & cheese over the stuff in the box…but of course some of our boys don’t agree. The problem is I make “baked” mac & cheese which definitely takes a lot longer. We’ve tried the HH creamy mac & cheese a couple times but it always seems to end up with a strange “sweet” taste to it. Not sure if that comes from boiling down the milk?? Has anyone else experienced this? exactly what you’re talking about from scalding milk in the past. whole milk which doesn’t turn out as sweet as the other kinds in my experience. Baked mac and cheese sure has it’s own glorious place in the world, though! I wondered if I was the only one with sweet mac and cheese, and I have tried a few times. I use store bought 2% milk, not whole, raw milk like Laura, so I figured that was the problem. I will try lowering the heat next time to see if that helps. I always make homemade mac&cheese, it just tastes better! Laura ~ I am curious why you avoid soy products? Is there something in the processing that you don’t like or ingredients? My two youngest children both had digestive issues and the soy formula and now soy milk seems to be the only thing that keeps their tummies settled. As always, I love your website and visit it daily. Aimee, I hope Laura will respond to your question. I thought I’d share from the research I’ve done about soy. There is concern because soy is full of phytoestrogens, which can mimic human estrogen in the body and cause health issues. Especially in young children, it may cause early puberty for girls, and cause reproductive issues in both girls and boys. I can’t remember all the details, but definitely google for more detailed information. Soy is also extremely high in phytates, which binds up minerals, making them unavailable to be absorbed and used by our bodies. There may be other concerns as well, that I’m forgetting now. Please do look into the dangers of too much soy in the diet, especially if it makes up a large part of your children’s diet. Best wishes to you! There is a lot of info on the dangers of soy…please do your research. I fed my children soy milk for awhile, too, but not anymore!! Over 91% of the soy in the US is genetically modified (cloned). It causes infertility, cancer, asthma, allergies, birth defects, and more. Dont consume any GMO’s! You can make a big batch of crust and freeze what you don’t use. I have a bread machine recipe that makes enough for 2 pizzas, or I use the recipe from Healthy Bread in Five Minutes a Day. (http://www.amazon.com/Healthy-Bread-Five-Minutes-Day/dp/0312545525/ref=sr_1_1?ie=UTF8&qid=1336065586&sr=8-1)Both are pretty easy with not much hands-on time, but take time to rise,etc. I think if you bought organic Annies to compare to yours, sinceyours is organic, yours would be cheaper! Thanks for doing this. I am always trying to tell people it really dosen’t take that much more time if any to make homemade, but they just don’t believe me. Can’t wait to see what you make next. 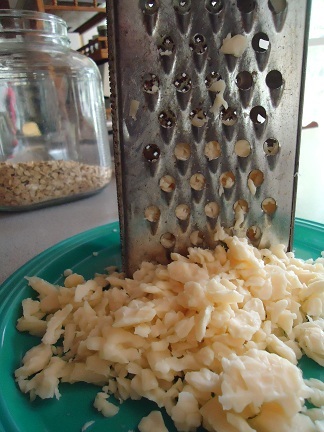 How else do you make sure NO cheese goes to waste!!! My grandma has made mac and cheese like this her whole life, so I grew up on it this way. Just add more milk and/or water to thin it out and keep stirring :-) Add the cheese after the noodles are cooked. I’ll give it a try. Thanks for the encouragement! How about trying homemade cookies or cake compared to boxed? To make your Mac n cheese looked more like the boxed set you could purred carrots or sweet potatoes to the homemade Mac n cheese. My kids enjoy it. Great experiment! I tell people all the time that healthy, homemade meals requires no more time or money than processed junk. This is off topic, but I’m so excited about this that I just have to share. The other day I made black bean brownies! Yes, brownies made out of black beans and since I substituted xylitol for sugar, they were even healthier! And best of all, no one could tell they were not normal brownies. Oh yeah, awesome. I made a second batch today with peanut butter, but went a little heavy on the cocoa powder, so they were a bit bitter, but if it wasn’t for that mistake they would have been perfect. Back on topic…how about comparing your pigs in a blanket with the unhealthier canned biscuit version? Or a homemade muffin recipe versus some boxed muffin mix? I made your homemade mac and cheese tonight for the first time YUM! My mother and I were talking on the phone about it later on how most families don’t have good home cooked sit down meals anymore its very sad. My FI and I plan on doing that once we are married. Thanks! I love that you time them both. I have been trying to convince others of this idea that healthy home made food is always better and worth the whole 30 sec(sigh so much effort) :) How about making cake or cookies compared to boxed stuff or spaghetti sauce? What about homemade bread? I make ours, but have never bothered to calculate whether or not it’s cheaper. Definitely more time consuming to make, but also much tastier than store-bought (unless you buy expensive bakery bread at $5.00/loaf). about the brownies, i make a homemade bisquick with whole wheat flour, sucanat, and palm shortening, instead of white flour, sugar, shortening, and then use aluminum free baking powder. u can find therecipe online and then modify it. they have a bisquick brownie recipe what i do is mix all my dry ingrediants which is the homemade bisquick, cocoa, sugar (i use sucanat) salt and then i use my food savwer system to vacum seal it and then write on the package the measurements for butter and eggs and the temp and time for baking. i like that on days when im busy and want a healthier indulgement treat it takes no more time than a box, and is in reality homemade bc i made the bisquik mix. i believe online when i searched my favorite mix was called the master mix and then i just alter it to a healthier version. works great for pancakes, biscuits casseroles just like the bisquick but healthier and less expensive. about the brownies, i make a homemade bisquick with whole wheat flour, sucanat, and palm shortening, instead of white flour, sugar, shortening, and then use aluminum free baking powder. u can find therecipe online and then modify it. they have a bisquick brownie recipe what i do is mix all my dry ingrediants which is the homemade bisquick, cocoa, sugar (i use sucanat) salt and then i use my food savwer system to vacum seal it and then write on the package the measurements for butter and eggs and the temp and time for baking. i like that on days when im busy and want a healthier indulgement treat it takes no more time than a box, and is in reality homemade bc i made the bisquik mix. i believe online when i searched my favorite mix was called the master mix and then i just alter it to a healthier version. works great for pancakes, biscuits casseroles just like the bisquick but healthier and less expensive. and also u can make your own frozen pizzas to and vacum seal. What a thorough job you did on this post. It is nice to know that the real food recipe was pretty close. Once you get into a routine and make them enough times it seems to go pretty fast. Muffins…the nasty packet ones are not much easier than whipping up a batch of homemade-and the homemade taste soooo much better. I have made your recipe a couple of times, but it seems as though it comes out a little gritty. Any suggestions on a smoother melting cheese? Wow! Thank you for the great information. It really doesn’t take longer to make quality food. I look forward to reading more. The first time you make ANY recipe from scratch, it might take a little longer……but it gets faster and easier each time. Haha I love your “woe is me” comment because that is sooo me. I’m all about convenience. I also loved the color comment because one of the reasons I haven’t made your mac and cheese is because it doesn’t look like “real” mac n cheese. It’s all about perspective… and I have to admit… you’re slowly changing mine. I love that you did this. I am always telling people it doesn’t take much more time, if any. When I have the time, I like to bake my mac & cheese. Some of these have been mentioned, but for future time test: muffins, biscuits, brownies, cakes, cookies, jello, pudding… I even say with my multitasking, it takes less time to make homemade bread- of actual hands on time, including grinding the wheat, than to run out to the store when you need some.